With 20 years of labelling experience, our labels are converted in-house by qualified operators according to very strict quality control procedures and with an average of 2-3 days turnaround time! Our labels are cut to specified size and wound on a core. Our labels are priced per 1000 labels and you can choose how many labels you want on each roll, it will never affect the price. We are able to offer over 250 different sizes and shapes of labels, Tickets and tags. Why not get a detailed quote from us, our prices are very competitive! We have hundreds of combinations of different stock and adhesives including Plain paper, Thermal, Fluorescent, Indestructible material, plastic, polyester, stickers ,price tickets, hang tags and garment wash care labels (taffeta and satin) and Hotmelt and acrylic adhesives to name a few. Contact Us and we will be able to provide you with a solution for your specific application or you could get some samples and test them yourself! From extreme environments including clean rooms, chemical baths, freezers and high humidity, to standard materials that satisfy the application, ADE is experienced at developing effective working solutions to meet virtually any challenge. We specialize in the supply of wax, hybrid and resin type Thermal Transfer Ribbons suitable for all popular Barcode Label Printers. ADE supplies only the finest ribbons to assure you of trouble free operation and minimal printhead wear. After having 20 years of experience in barcode label printing, we offer thermal transfer ribbons suitable for most label printers on the market today. Thermal transfer plain barcode labels provide durable thermal ribbon printing for labels that will endure rough treatment, rubbing or sunlight. All of our thermal transfer barcode labels are produced from high quality materials and converted by using the very latest in label slitting and converting equipment. Thermal transfer removable labels combine the features of highly durable thermal transfer label printing and of being able to remove the labels after they have been applied without leaving unsightly or damaging adhesive residue. Perfect for the application of temporary labels that you don't want to damage your packaging when removing the labels. ADE. specialise in manufacturing thermal transfer removable barcode labels that will stay affixed when you need them and will remove neatly and cleanly when you don't. For when you need your thermal transfer barcode labels to be made from water resistant or tough synthetic stock, you can't go past our range of thermal transfer synthetic barcode labels. Manufactured from durable materials, these barcode labels are printable by most thermal transfer barcode label printers and will survive various environments where paper stock based labels just can't. Our range of thermal transfer gloss barcode labels will give you that full gloss finish for your labels yet still allow you to print barcode, text and graphics with a thermal transfer barcode printer. thermal transfer gloss labels are perfect for when you products are exposed to direct sunlight and that little bit extra in label presentation is required. Our thermal transfer fanfold labels are perfect for making self adhesive labels for your mailing or office admin labels. Print from your inkjet, dot matrix or laser printer. We manufacture these fanfold labels from high quality materials in various sizes and quantities. Tinted thermal transfer barcode labels are the ideal solution for location labels, delivery labels and courier labels where the uniqueness needs to stand out. We offer an extensive range of colour's and sizes that will suit your labelling needs and provide easy over printing from any thermal transfer label printer. Direct thermal printing is the cost effective alternative in barcode label printing. Our range of direct thermal labels will suit your applications and label printing requirements. Made only from quality materials, these labels are available in a range of core, diameter sizes and widths to suit almost any direct thermal label printer. Our direct thermal removable labels are perfect for when your labels are only applied on a temporary basis. Our high quality removable adhesives will not leave unsightly or damaging residue after the labels are removed. Our removable direct thermal labels are made from high quality materials and adhesives, and can be made to order. We can provide your business with high quality tinted direct thermal barcode labels. Tinted direct thermal barcode labels are the ideal solution for location labels, delivery labels and courier labels where the uniqueness needs to stand out. We offer an extensive range of colour's and sizes that will suit your labelling needs and provide easy over printing from any direct thermal label printer. For that special application where only a tag will do, ADE, has the right tag for you. Available in various sizes and materials our tags are printable by most thermal label printers and will give you the flexibility and quality results that you need. Our laser labels are perfect for making self adhesive labels for your mailing or office admin labels. Print from your laser printer. We manufacture these labels from high quality materials in various sizes and quantities. ADE can supply a wide range of customized swing tickets and hang tags, produced exactly to your artwork specification. We offer a selection of materials and finishes, including variable colour preprinted cards using our flexographic printing machines (minimum order quantities do apply). Just starting up your own business and have no need for big quantities – why not purchase blank tickets, and a label & barcode printer from our SATO range, to print as many as you need – when you need! ADE supplies only the finest ribbons to assure you of trouble free peration and minimal printhead wear. We offer the choice of "Original Manufacturers) ribbons or high quality "Compatibles" for most makes of printers. Ribbons vary in quality from a general purpose wax (standard) used in situations where pricing, low density bar codes. Thermal ribbons come in three main types - wax, wax-resin or pure resin and are almost always black (other colors sometimes used are red and blue). These different types are made to print onto different label materials and are used when the life of the label needs to be long or the labels needs to survive harsh environments. Wax ribbons are for printing onto paper labels, where the life of the label can be years but must be kept dry and must not be abraded or subjected to certain chemicals or oil, which would melt the wax image. 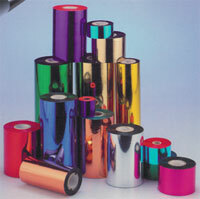 Wax-resin ribbons produce a finer image on very smooth paper or coated paper labels. The printed image is much more durable than wax, but can still only stand slight contact with water. Finally pure resin ribbons are formulated to print onto plastic labels such as polyester, polypropylene and vinyl. The "ink" is designed to slightly dissolve into or adhere to the plastic surface of the label and becomes extremely durable, depending on the plastic material and ribbon make used. Most printer manufacturers offer ribbon/label combinations which are known to work well together, which is particularly important as some combinations produce no image at all. Plastic labels with resin ribbons will survive outside in full sunlight, can stand immersion in water and may be resistant to chemicals and oils dependent on type. Often used in Automotive and Aircraft parts manufacture, any items stored outside and essential for the labelling of hazardous chemicals which must remain identifiable, for example, after being submerged in sea water for extended periods. The standard ribbon is a wax based range and meets the requirements of most of the standard applications in today's automatic identification markets (Auto ID). This wax based thermal transfer ribbon gives excellent results printing alpha-numeric characters, bar codes, and logos onto a wide range of paper and some synthetic media. The standard range is compatible with most thermal transfer printers in the Auto ID markets. 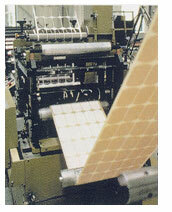 The Hybrid ribbon is a perfect balance in terms of quality, rub resistance, print operating speed and cost. This range is designed to meet the more demanding applications which require superior smear and scratch resistance and quality printing rotated (Ladder) bar codes. The ribbon is Wax/Resin based. The Wax/Resin ribbon gives excellent printing quality on coated papers and a range of synthetic media. The Super Premium resin based range meets the demanding industrial requirements of today's markets. The resin will give a high performance in extreme conditions and will produce a permanent image that will withstand the harshest of environments. The resin has excellent resistance to solvents, scratching, smearing and superb performance in high temperature applications.